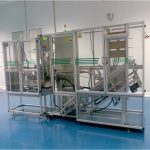 We have supplied semi-automatic and automatic solutions in a wide range of industry sectors. Whether your requirement is to automate a process or to assemble, handle or package products, we can work with you to develop a good solution. If we don't think we have the necessary technology or experience for your particular application, we will tell you quickly and do our best to point you in the right direction.